The REScEU project is looking for an University/Institution/Private company to subcontract the management of an élite survey and a mass survey, that falls withbin the scope of the project, in six European countries, i.e. France, Germany, Italy, Poland, Spain, and the United Kingdom. For the details of the surveys please consult the Document of Work you may find in the webpage dedicated to the "project". The content of the questionnaire will be provided by the REScEU team. With the results of the surveys, the REScEU team will produce reports and papers, maintaining the intellectual property of the results. The surveys must be conducted between September and December 2016. ELITE SURVEY: The target groups for the elite survey are national MPs and former MPs in the six countries. A total of n=70 interviews need to be conducted in each country (total 420 interviews). The questionnaire's lenght is estimated in 20 minutes. MASS SURVEY: The mass survey comprises 1,250 respondents per country (total 7,500 interviews) interviewed using a mixed-mode approach (CATI-CAWI). The questionnaire's lenght is estimated in 20 minutes. whether the offer covers the mass survey, the élite survey, or both surveys. Please note that REScEU project is subject to VAT exemption. On 24 May Maurizio Ferrera gives a public lecture at The Max Planck Institute for the Study of Societies. Since Italy’s entry into the ERM in 1978, the strategic goal of the country’s center-left elites has been to firmly anchor Italy’s unstable and weak political economy within “Europe.” Pursuing this goal has been a balancing act: molding an external constraint in Brussels to make it domestically “manageable”; forcing compliance at home through structural and institutional reform. Admission into the EMU with the first group of countries in 1998 was an emblematic sign of success: Italy was able to become a “pupil” of the top league of Europe. But it remained an (increasingly) bad pupil, especially under Berlusconi. When the crisis hit in 2008, Italy’s political economy quickly became a shambles again. The risk of being downgraded to a “program country” under Troika surveillance loomed on the horizon. As in the early 1990s, a technocratic government, led this time by Monti, adopted a harsh reform package and tied the country’s hands with a much stricter external constraint: the Fiscal Compact. In 2014, Italy exited the EU’s EDP and MIP procedures: back to the classroom. Under Letta and, more openly, under Renzi, Italy has also become more assertive, in an attempt to re-mold the external constraint in a more favorable direction. It remains to be seen whether the country’s political economy will be able to fully overcome the crisis and sustain the European political ambitions of the Renzi government. Rotta di collisione. Euro contro welfare? Rotta di Collisione. 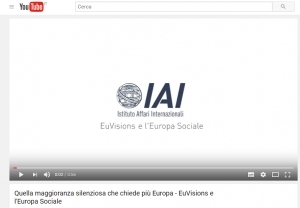 Euro contro welfare? is the new book by Maurizio Ferrera. ABSTRACT: The Europe of constraints and sanctions has exceeded the limit. We need new ideas to reconcile economic integration and the European social model. Is the EU weakening the social status of its member countries? Why is it so hard to bring together national solidarity and European economic integration? These questions spring from the decisions taken in recent years by the EU supranational authorities, which especially affect young people and the most vulnerable sections of the population. The reconciliation between welfare and Europe is no "mission impossible". However, it requires an ambitious intellectualand political effort. Maurizio Ferrera proposes concrete ideas to move in this direction and urges the national elites and the Brussels authorities to engage to strengthen the EU and improve its ability to ensure social protection and external security. That is the only way for the European project to produce widespread benefits and regain the lost legitimacy. my ERC-funded project REScEU(Reconciling Economic and Social Europe). in during the next few months. its Facebook and Twitter pages. the RSS feeds you find on this website. Just like security and peace, organized solidarity is a key political good for a stable and effective functioning of both the market and democracy and for mediating their inevitable tensions. In historical perspective, the national systems of social protection can be seen as the end result of a long process of ‘bounding’, ‘bonding’ and “binding” . During the twentieth century, the consolidation of territorial borders and of “nationality” filters (bounding) fed increasingly stronger sharing dispositions (bonding) among citizens, allowing for the establishment of compulsory mass social insurance (binding). In the absence of strong state boundaries eliciting mutual ties among insiders, the political production of organized solidarity (i.e. public welfare systems with high redistributive capacity) would have been impossible. As highlighted by the so-called ‘state-building school’ on political development, the formation of the European Union is partly replicating – under drastically changed circumstanced – the process of boundary-building which, starting from the sixteenth century, led to the modern system of nation-states (Bartolini 2005; Ferrera 2005; Flora 2000). This time around, however, the bounding–bonding-binding nexus is considerably more complicated and its activation cannot be taken for granted. While incisively re-drawing economic boundaries, the EU has indeed adopted a growing number of social provisions -some of them binding. But the construction of a “Social Europe” is faced with a daunting mission, as it involves putting in place a new, socially-friendly boundary configuration by working at the margin of the traditional and highly resilient set of state boundaries, nation-based bonds and binding redistributive schemes. This means engaging in dangerous balancing acts between “opening” and “closure”, with a view to cultivating pan-European sharing ties and crafting at least a minimally adequate system of inter-territorial and inter-personal redistribution, without however jeopardizing national systems. In the absence of a modicum of collectively organized solidarity, a complex and heterogeneous institutional construction such as the EMU is unlikely to reach viable levels of political stability. with the idea of a European Social Union (ESU) which I currently see as the most promising project for re-organizing solidarity on a European scale. The third aim is discuss some normative principles which might underpin the most delicate dimension of the ESU project, i.e. encouraging cross-national bonding and binding. The fourth section will finally try to highlight the political rationale of such principles and explain why the ESU should be considered as a key “political good”. The conclusion wraps up and reflects on possible scenarios. The intra-EU mobility of workers/persons (and in particular the latter’s access to the social protection systems of the receiving countries) is becoming an increasingly contentious and polarizing issue and is occupying the center stage in the so-called Brexit debate. The UK government is asking major restrictions of current legislation and other member states are very sensitive to this issue as well. Challenging the principle of free movement is no trivial matter. What is actually put in question are not only the foundational pillars of the single market, but of the EU as such, understood as a single (would-be) polity. The aim of the paper is to offer an analytical framing of this challenge. The next section will provide a brief historical reconstruction of welfare state building at the national level, highlighting the salience of boundaries and of the “bounding-bonding” nexus. It will also discuss the impact of European integration on the intra-EU boundary configuration in the sphere of solidarity. Section 2 will illustrate the state of play as regards mobility, summarizing the findings of empirical research on the economic and financial implications of free movement and of the social security coordination regime. Section 3 argues that –in addition to economic efficiency- the principle/logic that underpins free movement is that of “hospitality”, rather than the more general principle of solidarity. The section then discusses some unintended practical implications that follow from the logic of hospitality and that lie at the basis of the increasing contentiousness around free movement. Section 4 will discuss possible institutional remedies for containing political contention. The underlying assumption is that the preservation of free movement is key for the survival of the EU qua political association/community and that such preservation must be the object of an essentially political (and not merely functional) strategy on the side of EU authorities. The conclusion wraps up.